Small and so tough that cowboys called them "rock horses," the Spanish Colonial equines could easily climb rugged mountainsides. We are proud owners and breeders of the historic Wilbur-Cruce strain of the Spanish Barb, also known as the Colonial Spanish Horse. 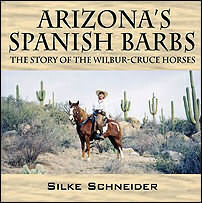 The Wilbur-Cruce horses lived isolated for more than 100 years on a remote ranch in southern Arizona under harsh conditions. Oral history as well as blood typing confirms the uniqueness of this herd which today consists of about 120 horses. "This particular herd of horses had an unusual history which traced directly back to a group of twenty six horses purchased for ranch use in 1885. These, in turn were descendants of the high quality stock used to supply the mission chain from Mexico into Arizona during the late 1600's and early 1700's." American Livestock Breeds Conservancy took on the rescue of this herd in 1990. Our horses are registered with three registries and blood typed. 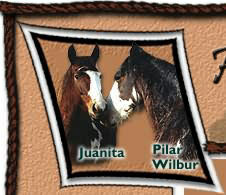 The Spanish Barb Breeders Association has created a special division within its registry to register the Wilbur-Cruce horses. The registrar is Janie Dobrott, HC 31, Box 95, Caballo, NM 87931. The second registry is the Southwest Spanish Mustang Association, Inc. The registrar for the SSMA is Darlene Rickman, Rt. 1, Box 58, Soper, OK 74759. Heritage Breeds Southwest established the first Wilbur-Cruce horses in southern Arizona in 1998, none remained in southern Arizona after the herd was dispersed in 1990.